Designed to address the infil & exfil operations of a Quick Reaction Force (QRF) team in mind, The QRF Series of boots offer a unique and purposeful option for when movement is essential. 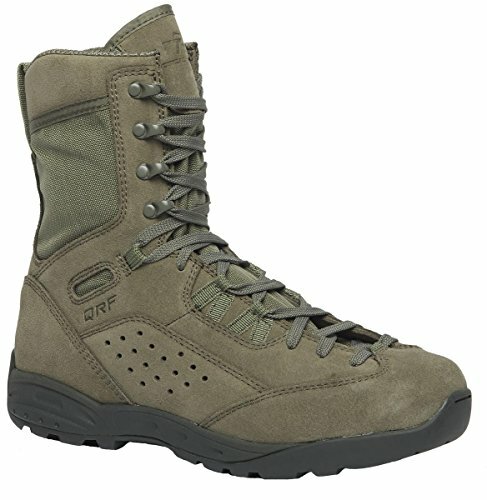 With design and performance influences from the outdoor trekking and approach shoe category, the QRF Series integrates an aggressive, lace-to-toe closure system for an optimal fit at the front of the boot, a medial side rappelling overlay and a low profile soling system to enhance performance in multiple environments. These AR 670-1 complaint boots are lightweight to help keep you on the move, with an extra-tall 9" height for additional support and protection. They are an ideal choice in tactical footwear for today's military personnel. 100% cattlehide leather & nylon fabric upper. If you have any questions about this product by Tactical Research, contact us by completing and submitting the form below. If you are looking for a specif part number, please include it with your message.